We just love this fabric! It is a blue stripe seersucker and is embroidered all over with fabulous red crabs! 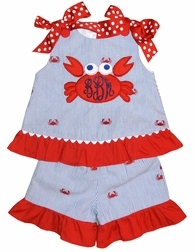 The dress/swing top is made with the crab fabric as the main fabric and is trimmed with a red ruffle and white ric rac. Dotted red bows decorate the shoulders. Butttt, the cutest thing?? 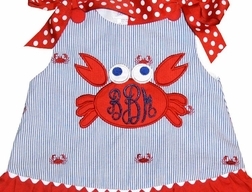 The huge Mrs. Crab that is appliqued on the front with your little girl's initials monogram in her tummy! The shorts or capris are made with the crab fabric and are also trimmed with solid red fabric ruffles.